Beach Oil painting on canvas w/ Golden Retriever, "Watching The Kids", 15"x24", by Mercedes Franklin. Private Collection. Marsh Oil Painting on Canvass, "Sum...Sum..Summertime", 8x8, by Mercedes Franklin. For Sale. It can be as hot as hell in the South. I thank the powers that be for the cool waters. I am a slave to anything that is cold whether it be water or air conditioning. 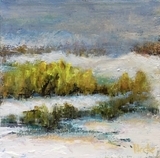 Marsh Oil Painting on Canvass, Marsh, "Secluded", 12"x16", by Mercedes Franklin, Private Collecion. There was a time when the gulf coast had lots of quiet areas. Not so much anymore. When I found this location it reminded me of days gone by. It was a lovely place to pass some time. Dogs Oil Painting on Canvass, Standard Poodles, "Nothing Like A Day At The Beach", 20"x24", by Mercedes Franklin, Private Collection.